Evelyn Raynard ~ at Listowel Memorial Hospital on Tuesday, September 18, 2018, Mrs. Evelyn Mary (Donaldson) Raynard of Listowel, in her 82nd year. Wife of the late Bill Raynard (2017). 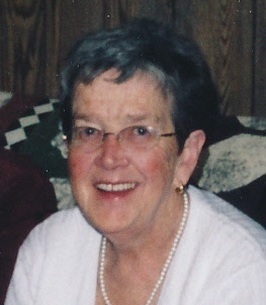 Mother of Pauline Hartman of Kitchener, and grandmother of Ken Streeter, and Kurtis Hartman. Sister of Ernie and Mary Jane Donaldson of Kitchener, and remembered by her nieces and nephews. The funeral service will be held at Knox Presbyterian Church, Listowel on Saturday, September 22nd at 11:00 a.m., with visitation one hour prior. Rev. Don McCallum officiating. Interment in Mount Pleasant Cemetery, Ethel. Pauline and Family I was sorry to hear the news of your mom’s passing. I have many memories of your mom and dad and the time spent back and forth with our family. You are in our thoughts and prayers. We will miss Evelyn's laughter and friendship. OUr thoughts and prayers go with Pauline at this difficult time. So sorry of hear of Evelyn's passing. We got to know her and Bill at MacKenzie Camp and enjoyed her sense of humor and bubbly personality. She will be missed by everyone that knew her. Our sympathy to the family. Sorry to hear about Evelyn. We had a lot of fun camping at Mackenzie trailer park with her and Bill. They will both always be missed. Pauline and Family. Our thoughts and prayers at this time of sorrow. MY sympathy. Evelyn will be missed especially at our Tea & Chat sessions. Our condolences to your family. So sorry for your loss. Thinking of your family during this difficult time. Sweet Dear Lady. She will be missed.